It’s no secret that marketing execs have been riding the “green” trend to sell products. Everything from sandwich bread to socks has been slapped with labels reading “natural” and “organic” faster than you can say Mother Earth. Unfortunately, no one is regulating the ingredients. Except in the case of organic food products, anything and everything can go into the manufacturing and the label can say whatever the marketing guys want it to to make it fly off the shelf. And who is the worst offender? The cosmetic industry. Aveeno, Herbal Essences, St. Ives, Estee Lauder … ring any bells? 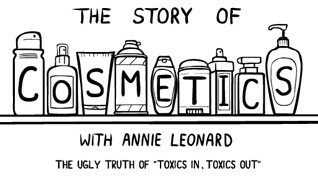 Annie Leonard, my number one go to expert on stuff, has done another fabulous job of giving us consumers the inside story of just how the giants are poisoning our bodies and the environment with shampoos, deodorants and cosmetics. And, as always, she does it in a fun and brilliant way. Watch her Story of Cosmetics now!